The Light Rail route is a varied and attractive one, but because it uses a pre-existing goods line the access can be challenging, especially from Glebe Point Road. However the smart, wheelchair and stroller accessible trams have proved very popular on a dedicated route where the more conventional heavy rail would be inappropriate. Climb the steps or ramp to the Light Rail platform and look back. Here is the mouth of the tunnel under the Glebe ridge that emerges at Jubilee Park. The tunnel, viaduct and bridges were built to convey bulk cargoes and troops to Darling Harbour during World War I. There are expansive views from all parts of the viaduct. The conversion of the goods line to Light Rail in 2000 was the result of a twenty-year campaign by the Glebe Society. Light Rail is already being extended further west, and there is currently a study to extend it though the CBD and to the Universities of NSW and Sydney. Cross Bridge Road on the footpath attached to the railway bridge. The first building on the other side of Bridge Road (on your left) is Green’s Wool Store (1905), smaller than the massive ones on Wattle Street, but a good example of warehousing along a major route to Darling Harbour. Decorative sculpture is unusual in Glebe, but there are rams heads on all four facades of this woolstore. 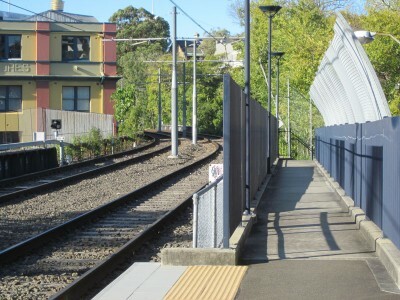 There are three steel railway bridges in Glebe, all between here and Wentworth Park, because the roads are too wide to be bridged by a brick arch. This first bridge is the only one to have a pedestrian footpath attached, mainly for the safety of students at Blackwattle Secondary College, which can be seen at the head of the Bay. Descend the steps to Railway Street, continue east to Darling Street (Ralph Darling, Governor of NSW 1825-31) and turn right.